At least during my whole childhood chard was one of the most hated veggies. I only knew it as substitute for spinach, blended and eaten with potatoes. Grrr…. Then for a long time I abandonded chard from my kitchen and table. After years of chardlessness I gave this green a new chance. And what can I say? It convinced me! 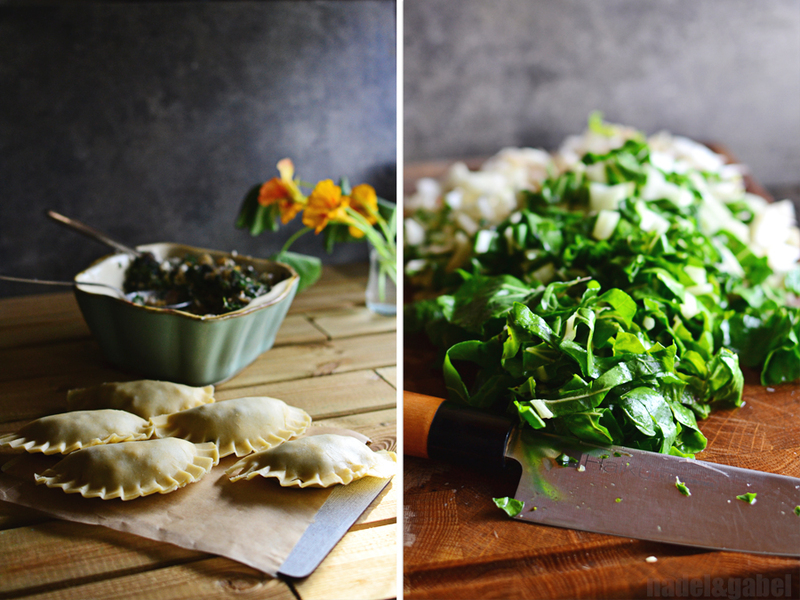 Cause what I discovered now: Chard is so versatile. It cuts a fine finger in asian stir-fry dishes as well as in a fresh herby quiche. 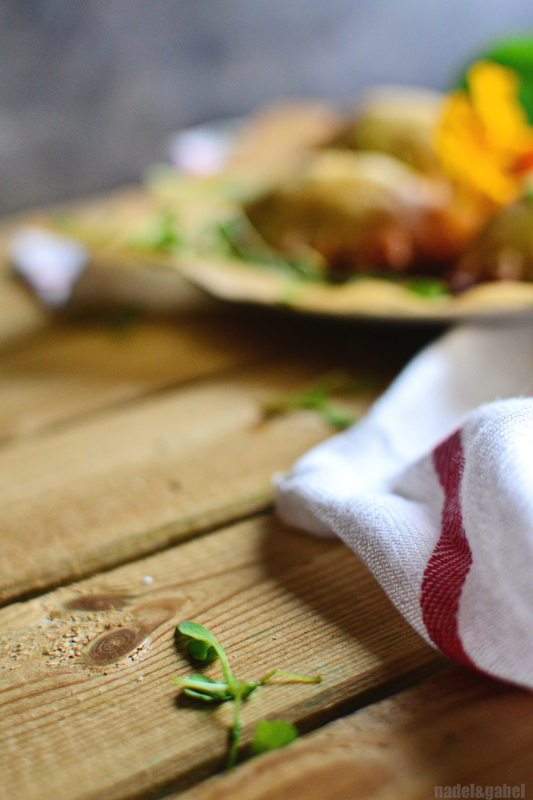 It’s nice on a pizza bianco with some aromatic cheese and, well, Ottolenghis swis chard fritters are kind of a staple in our household. And by the way, chard is damn healthy! It’s rich in vitamin A, K and E as well as minerals. 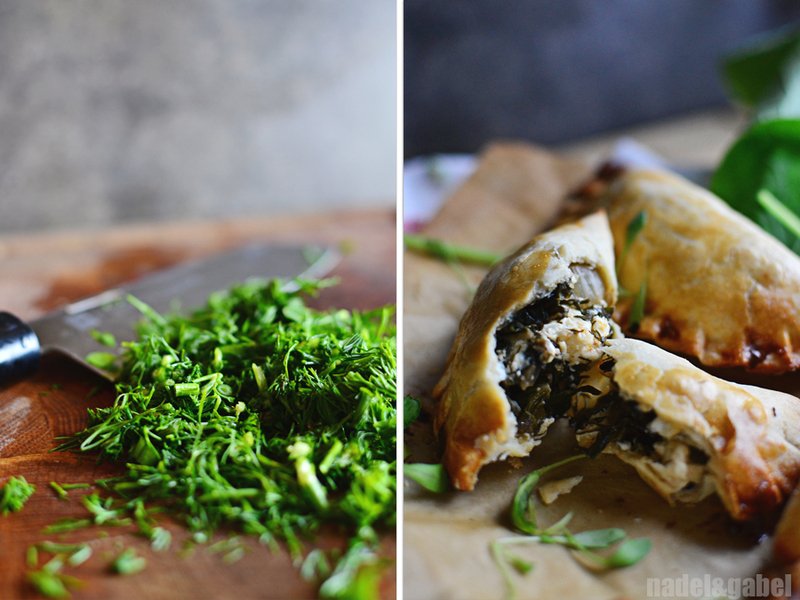 These chard and feta empanadas are kind of a mediterranean fusion recipe. It obviously draws from arab as well as spanish cuisine …. and when you think about al-Andalus an the cultural exchange that took place in medieval times on the Iberian Peninsula this may seem far-fetched only at first sight. 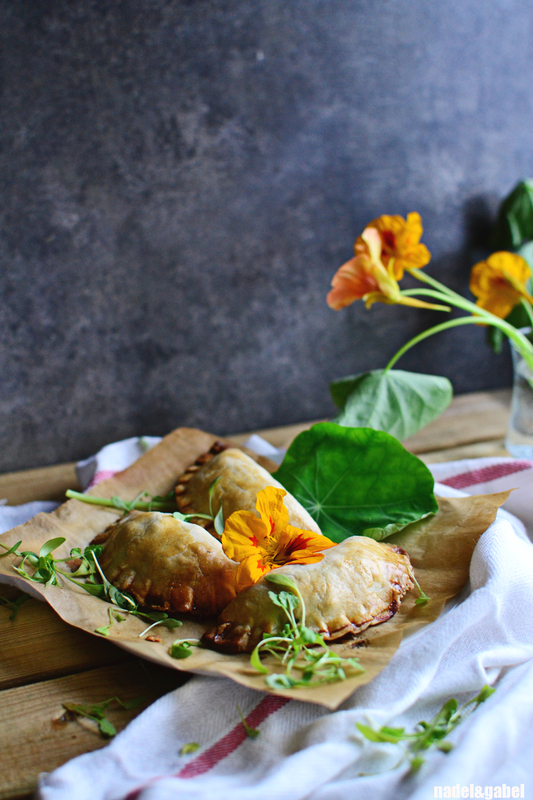 I added a good portion of dill to these empanadas. I lately discovered this long neglected herb for me again. If you are not that much into dill you can easily substitute it partly or totally by parsley. And perhaps a bit of mint? 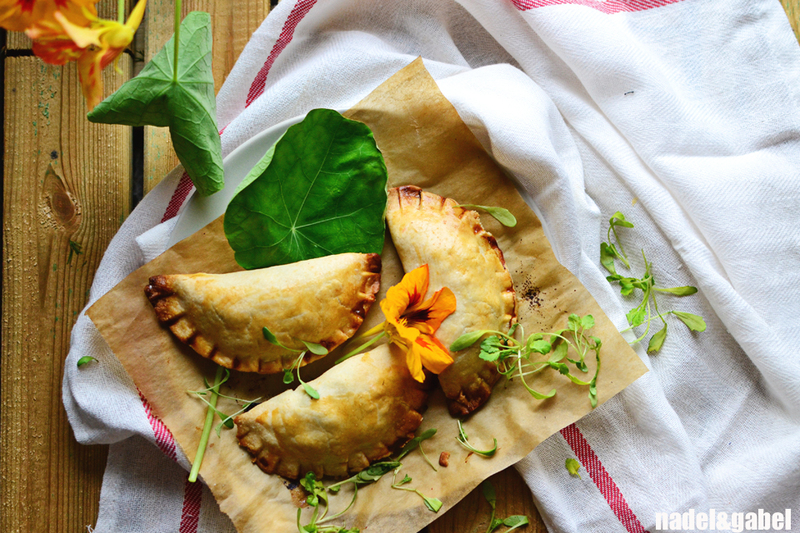 The lard that I used for the pastry gives the empanadas a hearty taste. If you are vegetarian or just don’t like the taste of lard, you can replace this with butter. Prepare pastry crust: Mix flour and salt. Cut cold lard into small chunks and work into the flour, either with a fork or with a pastry cutter. Add yoghurt and perhaps a few drops of water. Work quickly. Form a ball, wrap into foil and store in the fridge for at least 30 minutes. Wash chard, then chop it. Also chop dill, onions and garlic. In a large pan heat olive oil and sautée chard together with onions and garlic for about five minutes (I usuallly start with the stems adding the leaves only a few minutes later.). Set aside and let cool down. If it is at room temperature add crumbled feta cheese and chopped dill. Season to taste with salt and pepper, nutmeg and smoked paprika powder. On a working surface roll out pastry crust thinly. 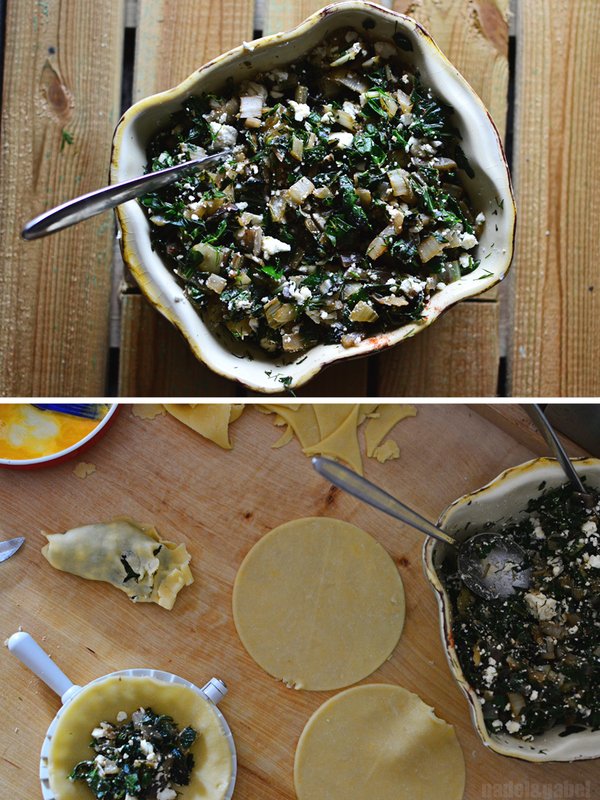 The easiest way to make the empanadas is to use a dumpling/ravioli mould. But you can also get along without. Then f.ex. use a drinking glass to cut out circles at about ∅12 cm. Fill with a tablespoon of chard-cheese-filling. Brush corners with egg wash, fold over one half and press ends together with a fork. Roll out and fill pastry as long as either the pastry or the filling ends. I ended up with 20 empanadas (although two broken ones 😦 ). Lay out filled pastry on a baking tray lined with baking paper. Heat oven to 200°C. When you’ve assembled all empanadas, brush with remaining egg wash and bake in the oven for 15-20 minutes until the edges are turning brown. Eat warm or cold, best accompagnied with a bowl of salad.